This Greenfield project is located 50 kilometers South-East of Estevan. The facility is owned and operated by Steel Reef, with construction being completed in late 2016. The plant is capable of a wide range of processing services including gas sweetening, NGL extraction, compression, and propane fractionation. The North Portal Gas Plant was a two-phased greenfield project built from the ground-up by Steel Reef. The facility—which is located outside the town of North Portal—remains Steel Reef's Largest operating facility to date. The Kisbey Gas Plant is stationed approximately 25 kilometers East of Stoughton, Saskatchewan. In 2016, Steel Reef purchased 50% ownership in the plant and is now the operator. The gas processing services cover inlet compression, sour gas incineration, and the production of a C3/C4 blend along with a stabilized C5+ condensate blend, both of which are trucked out. Gas is received through various batteries connected via a pipeline network that includes two field compressors. The Nottingham gas plant is Steel Reef's most recently acquired asset, purchased in July of 2017. The facility is a gas processing plant which includes a full fractionation plant, located near the town of Nottingham in South-East Saskatchewan. The plant is capable of both the extraction and fractionation of natural gas liquids, acid gas flaring, gas sweetening, and compression. After processing, the product egresses via the Transgas pipeline network while the NGLs are trucked out. Built in 2014, this greenfield project was designed to transport and store clean oil from the 13-18-26-18W3 oil battery to the 13-12-30-22W3 Tank Farm. The pipeline allows up to 15,000 bbls/day of oil to be transported from the Plato area into a Kindersley oil gathering system. In total, the pipeline is 57.2 kilometers long. 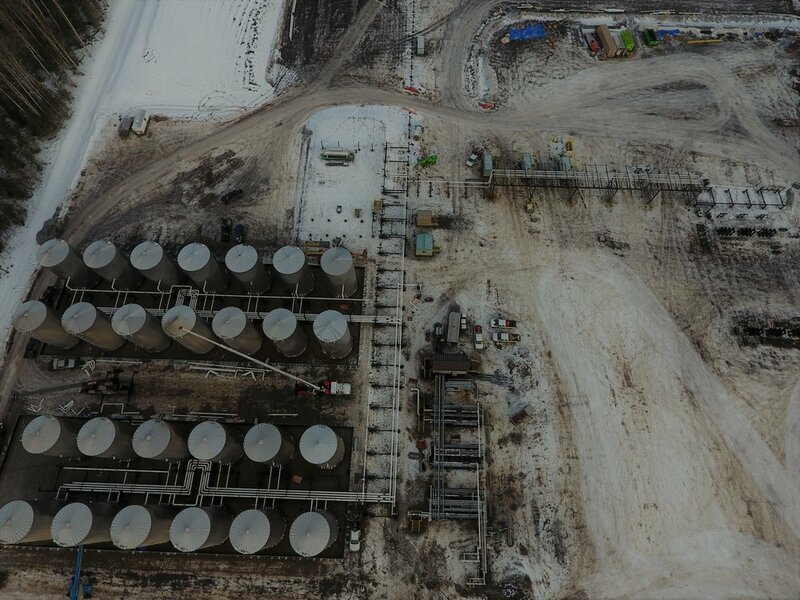 Located in the heart of the Charlie Lake light-oil play, The Gordondale Clean Products Terminal is capable of batching crude oil, condensates, and NGL mixes onto the Pembina peace pipeline at the northern end of the Peace River arch of North-Western Alberta. The Glen Ewen Gas Plant is located approximately 75 km East of Estevan and 10 km East of the town of Oxbow. The Gas Plant processes low pressure sour gas from producers in the area. The Coleville Gas Plant is located approximately 21km north west of the town of Kindersley in Western Saskatchewan. The facility is a sweet gas processing facility and includes a lean oil plant, and a shallow cut refrigeration plant.